The LA Auto Show opens up tomorrow for the press, but full details on the 2014 US Spec Nissan GT-R have been released. Along with Nissan's own press release, Autoblog and Road and Track both have details. Center console with a glipse of the new red amber interior. Full Nissan Press Release after the break. Considered by many to be the perfect "street-able" supercar at its launch, the team behind the creation of the Nissan GT-R has never slowed down. The relentless ongoing development of the GT-R has been driven by the fact that the GT-R competes in a rarified supercar segment against vehicles costing more than twice as much – and where bragging rights can be won or lost by mere fractions of a second. The new 2014 Nissan GT-R continues the tradition. Set to go on sale at select certified dealerships in the United States in January 2013, the latest iteration of the GT-R is another step forward in the effort to deliver passion and emotion to customers through "extreme development." Much of that development has taken place on the world's most challenging racing circuits, including the famed Nurburgring where the GT-R set production car lap records in both 2008 and 2009. The most grueling of these ongoing track tests was staged in May 2012 with the entry of an essentially stock Nissan GT-R in the Nurburgring 24 Hour sports car endurance race, where it finished 1st in class and 30th overall. More than just a test of the GT-R's durability and reliability under the most extreme conditions, the around-the-clock race was also a development trial for key GT-R senior engineering staff members that were involved in every stage of the project from vehicle prep to pit stops to post-race teardown and analysis. The experience is expected to have a long-ranging impact on the growth of the GT-R and the core development team. "With the entry into an actual 24-hour racing competition, GT-R's unique development process not only took an incredible step into a new dimension, it did so under the eyes of 100,000-plus spectators," said Al Castignetti, vice president and general manager, Nissan Division, Nissan North America, Inc. "The development of a super high performance vehicle demands testing your own limits as well as the vehicle's, which was the case at Nurburgring and will certainly pay off in our GT-R customers' enhanced driving enjoyment." 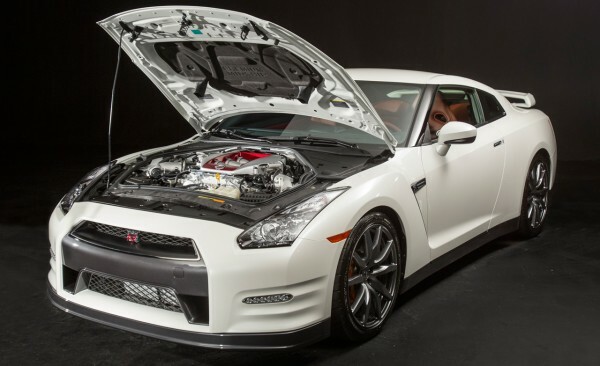 Following a major change to GT-R's renowned engine for the 2013 model year – including improved intake efficiency, reduced airflow resistance, improved exhaust emissions efficiency and a 15-horsepower increase to 545 hp (along with a 15 lb-ft increase in torque to 463 lb-ft) – the development of the engine continues for the 2014 model year. New fuel injectors are adopted for enhanced torque response in the 4,500 – 6,000 rpm range, improving throttle and acceleration feel at mid- and high-rpm ranges. Also, an oil pan baffle has been added to stabilize oil behavior and oil pressure under high performance driving conditions. The baffle reduces rotational friction, which contributes to the increased responsiveness. As in previous years, each engine is hand-assembled from beginning to end in a special clean room by a single specially trained technician, a process similar to racing powerplant construction. For 2014, an aluminum nameplate is added to each engine showing the name of the engine constructor. The GT-R's advanced VR38DETT 3.8-liter twin turbo V6 engine again features innovative plasma-sprayed bores (versus cast iron liners) for reduced friction, lighter weight, enhanced cooling, power output and fuel efficiency; a symmetrical independent intake and exhaust manifold system featuring twin high-performance IHI turbochargers; a secondary air management system for improved cold-start emissions performance; a thermostatically controlled oil-cooling system; an oil scavenger pump to maintain oil flowing to the turbochargers; and a lateral wet and dry sump oiling system. Fuel economy is again rated at 16 mpg City and 23 mpg Highway. The Nissan GT-R's unique Premium Midship platform, created expressly for use with the GT-R, enables the use of a world's first independent rear transaxle ATTESA E-TS all-wheel drive system, which optimizes weight distribution and handling capability. The rear drive-biased system can vary torque split from 0:100 to 50:50 depending on speed, lateral acceleration, steering angles, tire slip, road surface and yaw rate. Of note is a special GT-R-specific yaw-rate feedback control, which measures the differences between the target yaw rate calculated from steering angle and actual yaw rate detected by the yaw-rate sensor and G sensor to adjust torque bias. The Premium Midship Platform layout places the transmission, transfer case and final drive at the rear of the vehicle, without the use of traditional torque tubes, allowing the suspension to operate independently and optimizing tire grip at each corner. Contributing to overall vehicle balance and low center of gravity, the unique offset input and reaction shaft design of the rear transaxle enables a shorter design profile versus a typical manual transmission, moving the concentration of powertrain weight lower in the vehicle. Chassis development also has been continued for 2014, enhancing the sense of "grabbing the road" and enhanced high-speed handling. The front suspension link bush location has been changed and with a new anti-roll bar the front roll-center height has been reduced, along with a change in spring and shock absorber specifications to lower the center of gravity. Maintenance of front suspension alignment has also been improved. Handling duties are again managed by a sophisticated 4-wheel independent suspension system mounted to high-precision six-point front and rear subframes. A special Bilstein® DampTronic driver adjustable shock absorber system utilizes multiple vehicle information systems to provide appropriate damping forces and high level of control for a variety of driving situations. The DampTronic system features three driver selectable settings - Normal; Comfort, for maximum suspension compliance; or R. The same three-stage adjustability is also available for the VDC system and transmission shift operation. Again in 2014, the GT-R runs on Dunlop® SP Sport Maxx GT 600 DSST CTT ultra high performance run-flat nitrogen-filled tires designed to match the suspension characteristics. Standard tire sizes are 255/40ZRF20 front and 285/35ZRF20 rear. Optional Dunlop® SP 7010 all-season run-flat tires are again offered as part of the Cold Weather Package. Stopping power is again provided by Brembo® monoblock six-piston front and four-piston rear calipers with 15.35-inch front and 15.0-inch rear Brembo® full-floating cross-drilled two-piece rotors and low-steel high-stiffness brake pads that minimize fade and provide intense stopping performance. The calipers utilize race car-style radial mounting to minimize caliper flex during extreme braking. The Nissan GT-R's rigid forged aluminum 20-inch wheels, manufactured by RAYS®, utilize knurling inside the wheels helps keep the tires from slipping around the wheels under heavy acceleration or braking. The wheels feature a premium dark (near black) finish, which provides a high quality, high-performance look. The Black Edition features special metallic black six-spoke RAYS® forged lightweight wheels in place of the Premium model's 10-spoke design. "The performance enhancements for 2014 signal Nissan's intent to keep the GT-R on the leading edge of international sports car design, technology and performance year after year after year," said Castignetti. 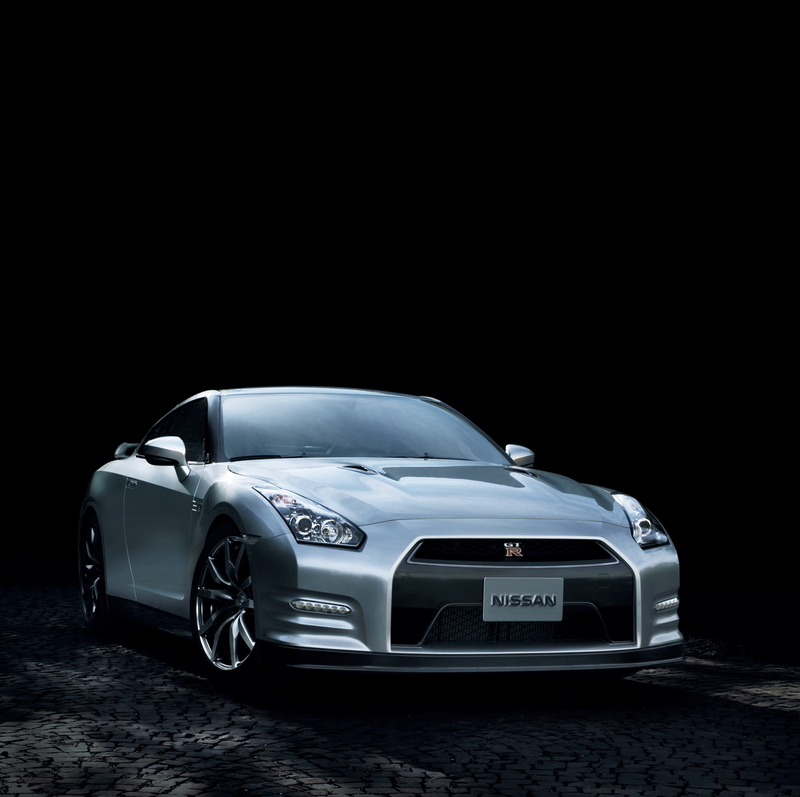 The Nissan GT-R's dramatic styling is unchanged for 2014. Every aspect, from the overall design to the smallest details, is created to maximize the vehicle's driving experience – as well as to suggest GT-R's supercar level of performance. The GT-R's hybrid body construction is again a combination of steel, carbon fiber and die-cast aluminum, providing a unique combination of stiffness, precision and lightness. The body features a low coefficient of drag of 0.26, achieving high front and rear downforce. GT-R's front fenders express power and stability, while the "aero-blades" on the fenders' edges provide optimum airflow around the tires and along the body. The vents in the fenders' trailing edges assist in providing front downforce and optimizing side airflow. The aggressive front end, with a large hood bulge and enlarged central air intake, provide a sophisticated style as well as undisturbed airflow for power and cooling. The "super wide beam" headlights feature three additional sub-reflectors (compared to conventional lights) to give a wide illumination spread. The Nissan GT-R's four-passenger cabin features a sloping "aero blade canopy" roofline and a curved C-pillar "sword edge," which expresses the distinctive GT-R identity, as well as facilitating air flow around the rear of the vehicle. The signature rear view of the GT-R is provided by its hallmark four-ring taillights, while air flow above and below the vehicle is managed by the functional rear carbon fiber underbody diffuser, rear venting, rear spoiler and large, integrated quad exhaust tips. The GT-R Black Edition's unique rear spoiler is designed to be as slippery to the wind as it is attractive to the eyes. Handmade in a limited monthly production run, a special coating allows carbon fiber "weave" to be felt by the touch. The lightweight dry carbon fiber material* is also incredibly strong, contributing to increased aerodynamic downforce. GT-R's advanced technology is present even in the vehicle's paint, which utilizes a durable anti-chip paint and "double clear coat" process. The 2014 color palette includes Deep Blue Pearl, Jet Black, Solid Red, Gun Metallic, Pearl White and a limited production 4-stage metallic Super Silver. Just as GT-R reflects a constant pursuit of performance improvements, driver and passenger needs and desires are also continuously reviewed. Takumi, the Japanese word for artisan, has always been reflected in the GT-R, which features a great amount of hand craftsmanship. The Premium model interior features a change in color and stitching for a higher quality look and feel. In addition, the Black Edition model's steering wheel features new coordinated red accents, providing a sportier appearance. The biggest interior change for 2014 is availability of a new optional Premium Interior Package with exclusive Red Amber color semi-aniline leather appointments with hand-stitching on the front seats, along with Red Amber accents on the instrument panel, steering wheel, door trim, armrests and shift knob. "Comfort and a sense of luxury refinement are never out of place, even in car with the ultra performance levels of GT-R," said Castignetti. "The new Premium Interior Package, which will be available in limited numbers, adds a great new look and really accents the high levels of craftsmanship found throughout each and every GT-R."
As in previous years, the key to the Nissan GT-R's usability as both a daily driver and a high-performance machine is its balance of functionality and comfort. It provides comfortable four-passenger seating and trunk capacity of two golf bags or suitcases. Sculpted performance bucket seats give the driver and passenger a comfortable driving experience, and soft pads are utilized on the dash in front of the passenger and both doors to give an extra level of comfort. The rear transaxle layout of GT-R, with a flat floor and narrow center tunnel, allows GT-R to have an optimal driving position. The GT-R Black Edition adds a unique red and black interior color treatment and Recaro® leather-appointed seats. The GT-R's cockpit-style instrument panel surrounds the driver, with all meters and multi-function meter at a uniform height to minimize the driver's head movement. A large center-mounted tachometer, with gear display on its upper right, as well as the easy-to-read graphics of the display, gives the driver instant detailed information, essential for the performance nature of the GT-R. Each meter features a dial plate design that evokes the idea of engaged gears, as well as a three-dimensional metal-like ring, suggesting the multi-dimensional performance of GT-R. A large, metallic-framed center console features an ergonomically designed shift lever and a red "engine start" button. 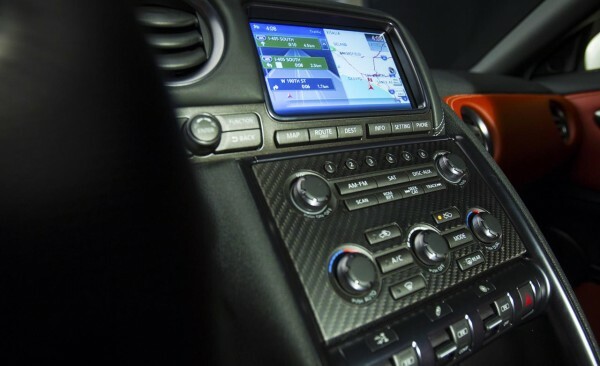 Carbon fiber interior trim is offered for all models. The centerpiece of the instrument panel is a video game-inspired multi-function display that was created in collaboration with Polyphony Digital, makers of the Gran Turismo electronic game. Eleven pages of information are available on this system, including mechanical and driving information, acceleration, brake pedal pressure, steering angle and a recording function with playback. Additional on-screen information includes a Navigation system and Bluetooth® Hands-free Phone System. The navigation system includes NavTraffic Real-Time Traffic Information and NavWeather capabilities (SiriusXM subscription required, sold separately). All 2014 GT-R models again include a specially designed 11-speaker Bose® audio system features two forward-facing woofers in the rear center armrest area. Rigid aluminum die cast panel-mounting of all speakers allowed Bose® engineers to perfect the acoustical performance of the GT-R sound system. Streaming Audio via Bluetooth® is standard. The 2014 Nissan GT-R is available in two models: GT-R Premium, which comes fully equipped with a 545-horsepower engine, dual clutch rear transmission, Nissan Navigation System, custom-designed 11-speaker Bose® audio system, premium near-black finish wheels and heated front seats; and the GT-R Black Edition, with special lightweight metallic black aluminum-alloy forged RAYS® wheels, unique red and black interior, Recaro® leather-appointed seats, dark headliner and dry carbon fiber rear spoiler. Just two options are available: a Cold Weather Package, which includes Dunlop® all-season tires and unique coolant/water ratio; and the Premium Interior Package.